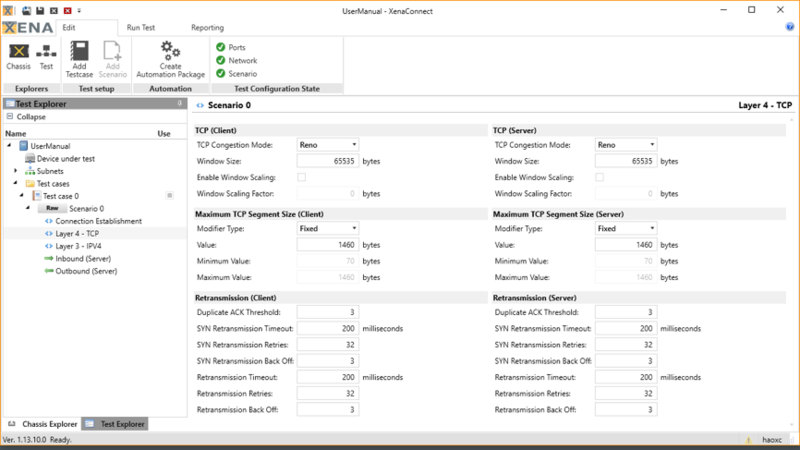 After you have reserved and assigned the ports for your test, you may need to customize the following parameters: subnet properties, load properties, connection properties, TCP parameters, and IP parameters. 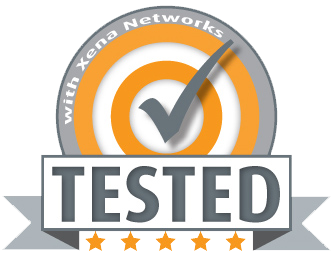 Subnet is an important concept in Xena L4-7 platform. There are two types of subnets you can define, IPv4 and IPv6 subnets. A subnet defines a range of IP address where the emulated clients or servers are located, e.g. an office LAN. A physical port on the chassis should always be assigned with a subnet. Subnet properties can be configured in Subnets. The Network Address and Network Mask Bit fields together define the Classless Inter-Domain Routing (CIDR) block of the subnet, e.g. 10.0.0.0/8. Users can modify both fields to form the CIDR block for testing purposes. This will offer a full range of IP addresses available in the CIDR block. For the CIDR block of 10.0.0.0/8, the available IP addresses will be from 10.0.0.2 to 10.255.255.255, resulting in 16,777,214 addresses (224-2). If this option is enabled, users can limit the number of IP addresses in the subnet by providing the first and the last address. This option should be enabled when the port is connected to an IP gateway function. This option can be disabled when the port is connected to a layer-2 DUT. When this option is enabled, users can enter the IP address of the gateway function that this subnet is connected to, e.g. 10.0.0.1 for 10.0.0.0/8 CIDR block. When the Use Gateway option is enabled, users can manually enter the MAC address of the port on the DUT that this subnet is connected. This option should be enabled to the server subnet if the client port is connected to a NAT, where the source TCP port in the client packet is changed before reaching the server. This option only affect the server subnet since it informs the server that different source TCP port numbers from client packets are expected. If this option is enabled, the MAC address of the port assigned this subnet is the same as the MAC of the NIC card. If disabled, users can specify a different MAC address for the port that is assigned this subnet. When this option is enabled, the port will send ARP requests to ask for the MAC address of the gateway (the value in Gateway Address) before starting the TCP handshake, if Use Gateway is enabled. The port will use the MAC address in the ARP respond message as the gateway MAC instead of using the value in Gateway MAC Address. The port will respond to ARP requests with its MAC address. If Use Gateway is disabled, ARP will ask for the first IP address of this subnet. Figure 12 shows an example with a test scenario of type Raw. To understand different types of scenarios, go to Section Test Scenarios. Traffic Load specifies the direction of TCP traffic. 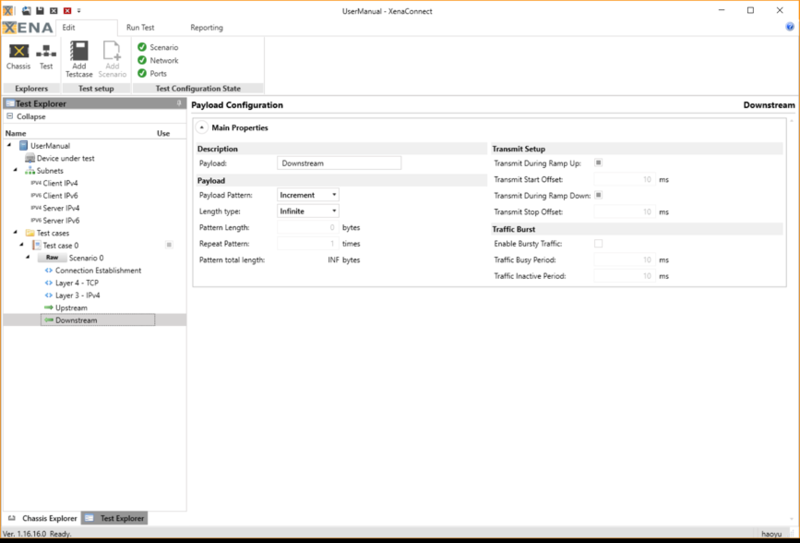 It defaults to download in Raw scenarios (traffic flows from the server o the client), but can be configured to upload and bi-directional traffic. 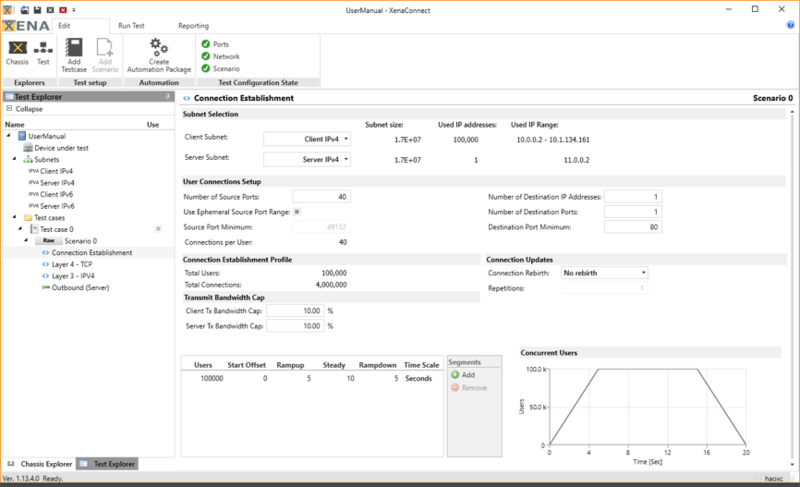 The payload utilization cap is specified in percent of line speed and defaults to 10%. The load profile specifies four time intervals: start offset, ramp-up time, steady time and ramp-down time. These can be specified in milliseconds, seconds or minutes. Users can also specify whether the scenario should transmit payload while in the ramp up or down phases. See Figure 12. 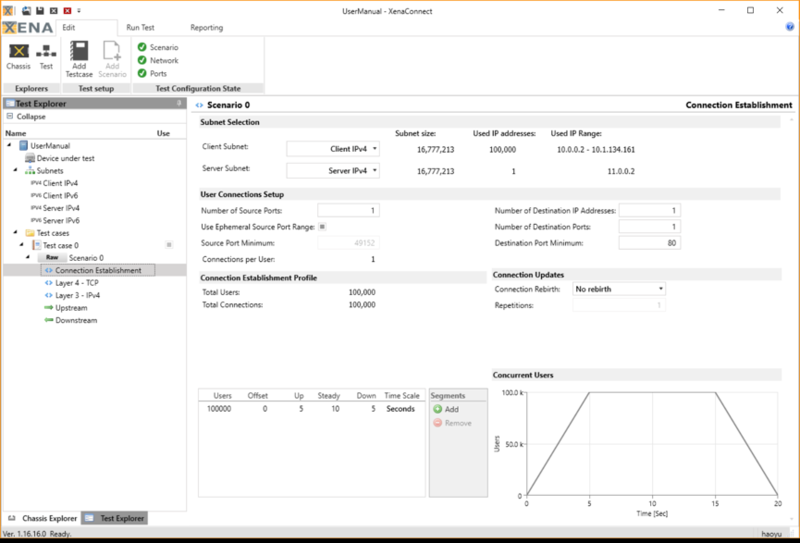 See Section Connection Properties for details. The following figure shows an example of 4 million TCP connections (100K source IPs, 20 source ports, 2 destination IPs, and 2 destination ports). Connection properties can be configured in Connection Establishment. A “User” in XenaConnect corresponds to a source IP address. 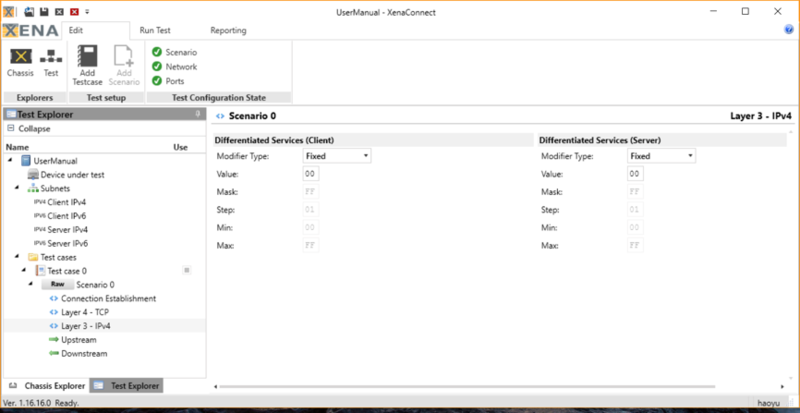 Use Connection Updates when testing a DUT with user connection repetitions. By default, it is set to No rebirth, which means that as soon as a user completes its TCP connection, the communication to the server is stopped. The other two options are With same Src IP and With new Src IP. Choose With same Src IP, when user connections should be recreated with the same source IP address. 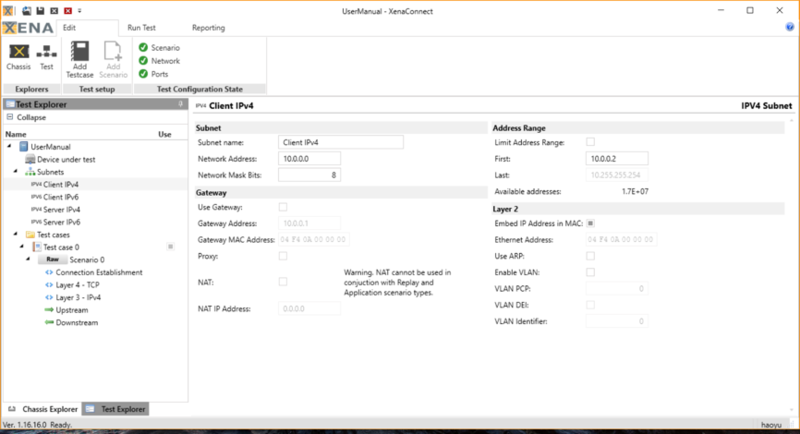 Choose With new Src IP, when user connections should be recreated with a different source IP address. These are the configurable settings for TCP. The window size and retransmission settings are common to all connections in a connection group. The MSS parameter can be made to vary across the individual TCP connections. For example it can be set to increment (and wrap around) between a set of values. The IP DS field defaults to a fixed value of 0. However, it can be made to vary across connections by specifying a range, an increment value and a mask of bits to be affected. In the example below (client) the middle four bits of the 8-bit DS field varies linearly and the both the two most significant and the two least significant bits are set to one.